NB This topic is also covered in the fact sheet E21 "Slow sand filtration for community or family use" which includes part of this fact sheet, since sand filtration can be used, although in a different way, either to treat effluents, or to purify water at family level. 1) What is involved ? The sand filter is an environmentally-friendly wastewater treatment method, which is relatively simple and inexpensive. Its principle involves percolating water through a sand bed. 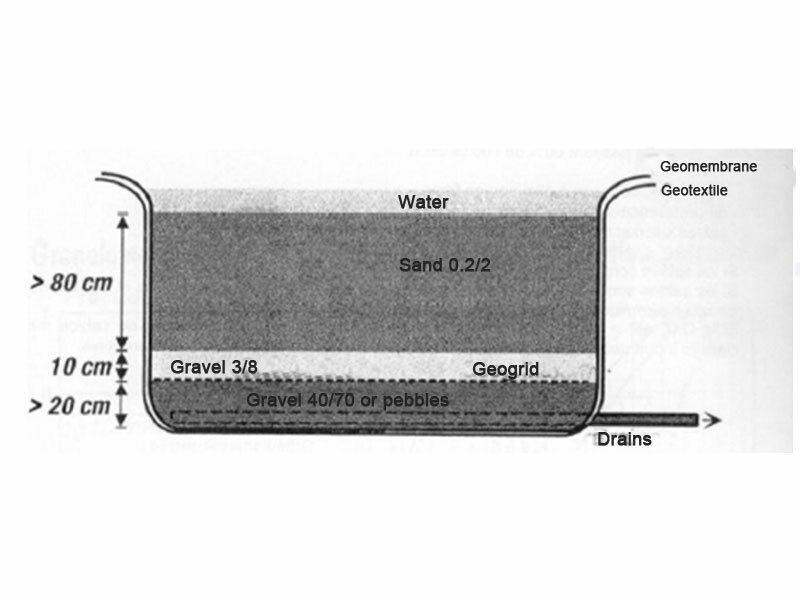 Schematically speaking, grains of sand form a layer which is penetrated by the water and which will stop larger particles in the intervals between grains acting like a simple sieve. Smaller particles will also be retained by the wall effect on the grain surface when they touch a grain as they pass through the filter. The smaller the diameters of the grains, and hence the longer particles remain in the filter, the higher the filter’s stopping power will be. - Rapid sand filters : Rapid sand filters need to be cleaned frequently, by back washing, which involves reversing the water direction. The first two require pumps and the use of chemicals (flocculation principle). A flocculent is used which, through a chemical principle, traps suspended matter and particles to form large flakes which are deposited by sedimentation. (Sedimentation means that suspended particles stop moving and settle). Unlike other sand filtration methods, slow sand filters use biological processes to clean water, and are non-pressurised systems. They can treat water and reduce the presence of micro-organisms (bacteria, viruses, microbes, etc.) without the need for chemicals and, if necessary, using a layer of activated carbon. Slow sand filters do not require electricity to operate. 2) Who use this means and since when ? Sand filtration is a technology that has been used in water treatment systems around the world since the 19th century. It is also more simply used to treat water in households and in emergency situations. It is finally used in some wastewater treatment plants where it provides initial effluent treatment. Sand filters for effluent treatment are used to filter wastewater by promoting the development of a biological activity that breaks down organic matter. They are part of the treatment systems described in fact sheet A17 "Various ecological treatment solutions" As explained in this fact sheet, water must, before being filtered, undergo pre-treatment, without which the filter would rapidly before irreversibly clogged. The water flows vertically through the filter. It can either be recovered from the bottom using drains and then fed on for further treatment, or seep into the ground. In the latter case, a detailed analysis needs to be carried out in advance to avoid environmental contamination. Sand filters are fed in the same way as vertical constructed wetlands (see fact sheet A20 "Macrophyte constructed wetlands"). They must be connected to a scoop system (intermittent water splashes) designed so that each scoop quickly spreads an even layer of 10 to 15 cm of water over the filter. Stones must be placed under feeding points to avoid washouts. Like vertical constructed wetlands, sand filters must operate alternately : 3 to 4 days of operation for 7 days idle. This arrangement calls for three filters in parallel. A depth of 80cm is sufficient for usual purification purposes, except for the elimination of pathogens. To achieve the latter, the filter must have a greater depth (about 2.5 m) or be preceded by more intensive pre-treatment. Slow sand filtration is only used for effluent treatment. Indeed, it was the first method used by many towns in the 19th century to treat river and stream water before distributing it. These filters can easily eliminate most of the micro-organisms that cause water-borne diseases, including protozoa, bacteria and viruses. Water passes slowly through a layer of sand 60 to 120 cm thick. As it passes through, several physical and biological processes filter the water and eliminate contaminants. After a certain time, the layer of sand contains a multitude of bacteria, algae and aquatic micro-organisms. These micro-organisms help filtration by eliminating contaminants. Sand that contains these organisms is said to be "ripe," and is best cleaned or replaced. This process can take several weeks or months, according to the water and its temperature. The layer of sand eventually becomes almost impermeable and slows down the flow of water ; it then has to be cleaned, usually by reversing the direction of flow of water to back rinse. Sand filtration systems cannot handle chlorinated water because chlorine has a detrimental effect on the filter’s microbial flora. If water has to be chlorinated, this should only be done after the filtration process, in reservoirs. Storage of water prior to treatment allows the network to be adapted to a variable demand, as sand filtration systems cannot provide higher rates of flow during periods of high demand ; nor indeed lower rates of flow during periods of low demand. These filters are only suitable for spring water with a low turbidity (low turbidity water), containing little algae and with no unpleasant colour due to contamination. They are not suitable for water with a high content of algae or clay, which tends to clog them. Spring waters rich in nutrients, however, can help the cleaning action of slow sand filters by contributing to their biological composition. They are usually of a fairly simple design, require little maintenance and have a low operating cost. 5) Where to obtain further information ?